So when my friend Rachel told me she wanted to come to Miami for her birthday, I was thrilled. Then I get a text, “Are there any races March 7th or 8th in Miami?”. We searched high and low, found two, and made a decision between those two. 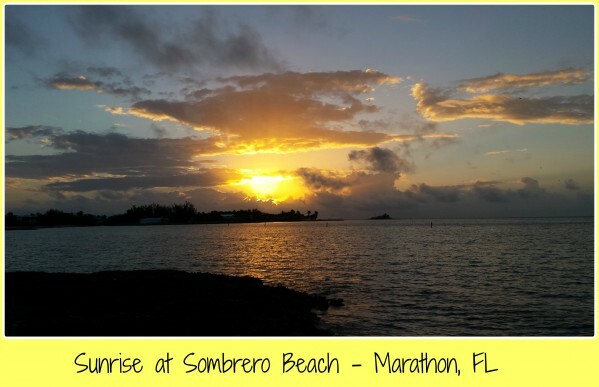 We completed the Sombrero Beach 15K Challenge on Saturday, and overall it was a fantastic experience! We woke up at 4am on Saturday and left my house by 4:45am, ready for the 2 hour drive. I expected traffic because there was a biking event in the Upper Keys, but we got there without any issues, and by 6:35am we were parking in the lot at Sombrero Beach Park. We made it out of the car and walked over to the shore, just in time to see the sunrise over the Atlantic Ocean. We picked up our packets and loitered about the beach, snapping pictures and taking in the beauty of this little park. Before we knew it the parking lot started to fill up and the crowd got bigger, and it was 8am, time for the race to start. Off we were, ready to tackle this 15K challenge. First up was the 10K course, which started at the beach and headed up Sombrero Beach Road, along a bike path. The course turned left onto Sombrero Boulevard, then along the Sombrero Country Club golf course, then a left by the back nine. We then headed up a small bridge onto Flamingo Island, a small residential island, ran through the neighborhood and followed the same route back to the beach. Rachel and I did amazing! Our pace was on-point, staying at or below a 13-minute mile throughout the 6.2 miles. I got a small cramp right at the 5K mark in my right thigh, but it quickly passed, and we finished the 10K in 1:22:05, a personal record for both of us. We were on fire! We approached the finish line just minutes after the 5K race started, crossed the finish line, grabbed some water, turned around and headed back out onto the course. At this point it was around 10am, and we figured we’d be uncomfortable, but no worries…we’ve got this! After all, we had “just a 5K” to go, which is roughly another 40-42 minutes, given our usual pace. But we didn’t have it. For the first mile I was great, trying to stay on pace and encouraging Rachel along, but the heat got the best of both of us. We just couldn’t keep up the amazing pace we had earlier. Shortly before the 2nd mile, Rachel felt ill, and we walked the rest of the course. Even so, we finished the 5K at 49:37, not terribly bad, all things considered. Also, we weren’t last, and that’s always a good thing. Once we were done and able to refuel our bodies we were fine, and if the organizers of this race change the start time, we’d definitely do it again next year! 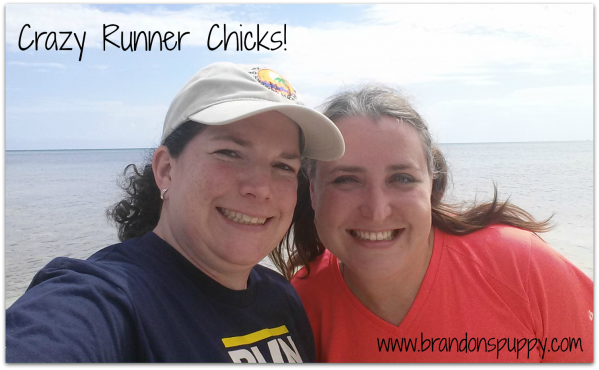 This entry was posted in Family & Friends, Health & Wellness, Run Manders Run. Bookmark the permalink. Thank you for running this with me! I’m sorry I got heat stroke. Aren’t I a Floridian?? ?